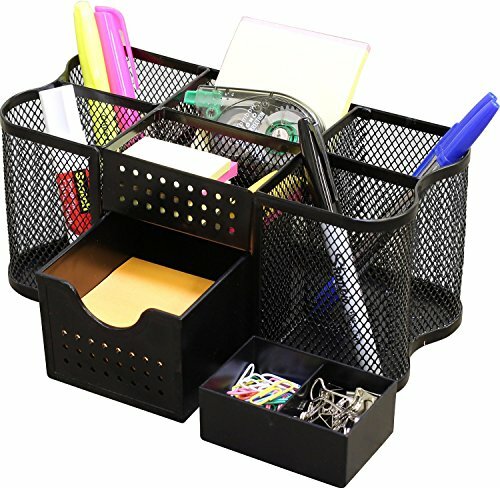 Foldable Auto Car Organizer— 25 x 17.5 x 13 inches when unfolded. When not in use, folds flat to 3 inches. 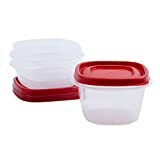 Very easy to carry and to store, Suitable for SUV, car, truck, jeep, mini van, vehicles in Automotive Interior Accessories. 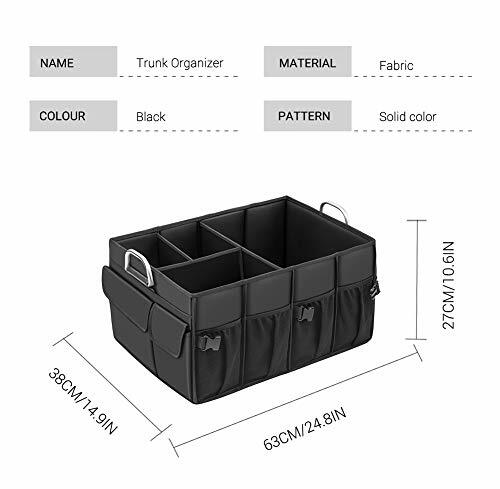 Special Design—The trunk organizer have two superior velcro at the bottom, you needn’t worry about the trunk storage will move when you driving the car. The two aluminum handles are extremely lightweight and strong, allows you to carry what you want. 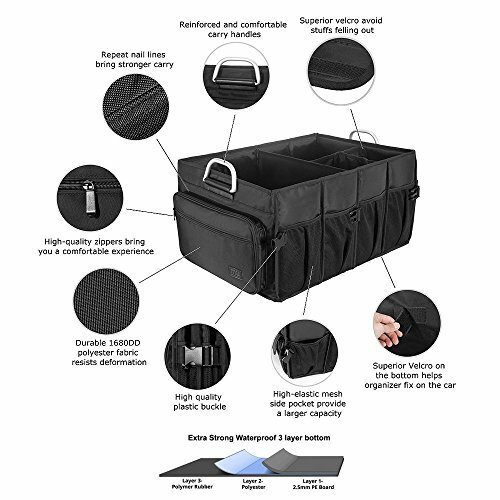 Convenient and Functional—You can fold a half size of trunk organizer when you wanna use it on the car front seat. 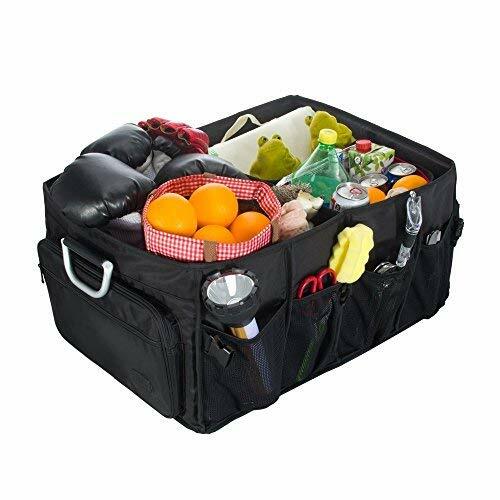 The trunk organizer also together with 8 high-elastic mesh side pockets which allows you to hold more things -groceries, tools, sports equipment, jumper cables and others. 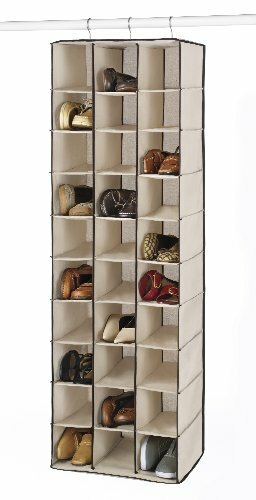 The removable sub-divider enables 4 different sized storage, meet any of your needs. Just because everyone else is content with a dirty, messy car trunk, doesn’t mean you should be too. 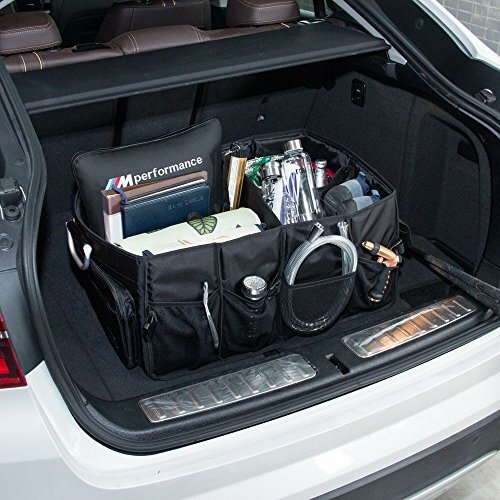 Get that trunk in order once and for all with the MIU COLOR car trunk cargo organizer. Fits any size of vehicle, from compact cars to SUV’s to pickups. Care: To wash, wipe surface with a damp cloth. Spot-clean as needed. Do not machine wash. 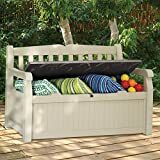 Size: Measures approximately 21.5″x14″x12″ (LxWxH) unfolded and 2.5″ thick when folded. 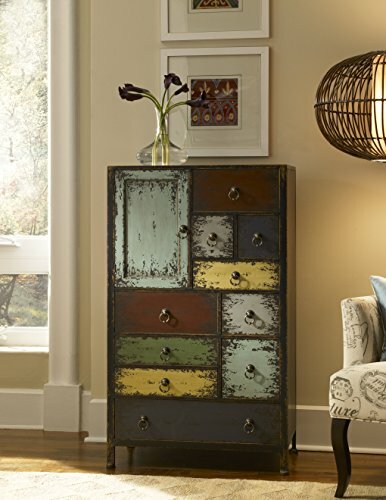 MIU COLOR is a retailer of home and lifestyle products founded in 2009. All of our products are designed with three values in mind: simplicity, functionality, and responsibility. Simplicity, for a beautiful, clean aesthetic that begs to be enjoyed. Functionality, for ease-of-use that can always be relied upon. And responsibility, for products that are manufactured under eco-friendly and equitable conditions. 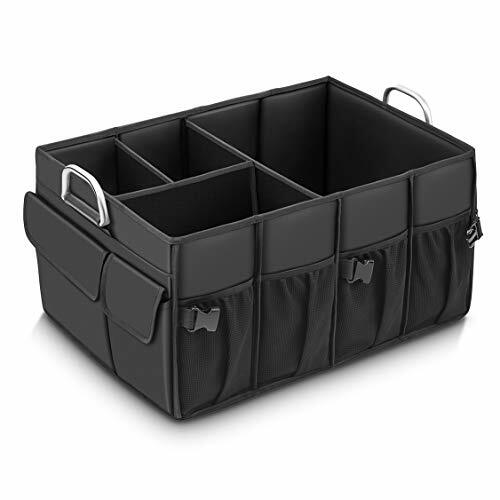 Foldable Auto Car Organizer—21.5x14x12 inches when unfolded. When not in use, folds flat to 2.5 inches. 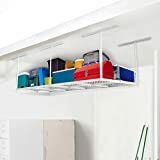 Very easy to carry and to store, Suitable for SUV, car, truck, jeep, mini van, vehicles in Automotive Interior Accessories. 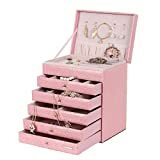 Special Design—The trunk organizer have two superior hook-and-loop fasteners at the bottom, you needn’t worry about the trunk storage will move when you driving the car. Two firm handles allows you to carry what you want. 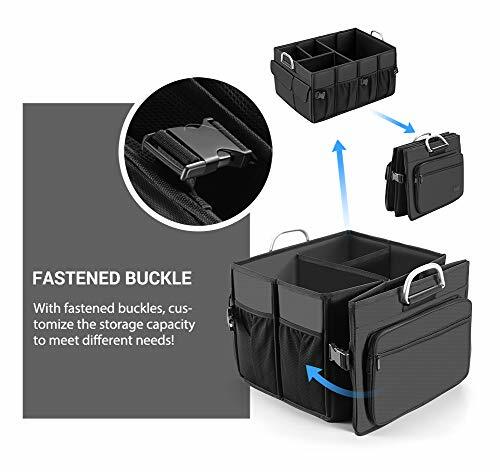 Convenient and Functional— The trunk organizer together with 10 high-elastic mesh side pockets which allows you to hold more things -groceries, tools, sports equipment, jumper cables and others. 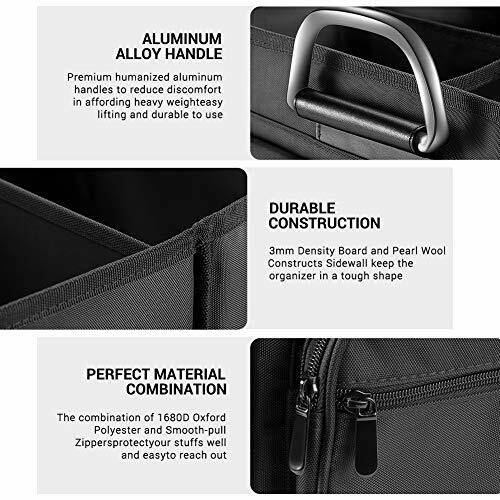 2 large compartments to organize groceries and auto supplies, meet any of your needs. For extra functionality, an orange safety triangle is sewn into the side of the trunk organizer in case of emergency. Warranty: 1 year. 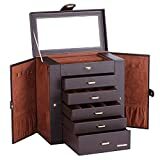 If the trunk organizer was damage within 6 months, just contact us, we can offer free replacement service.